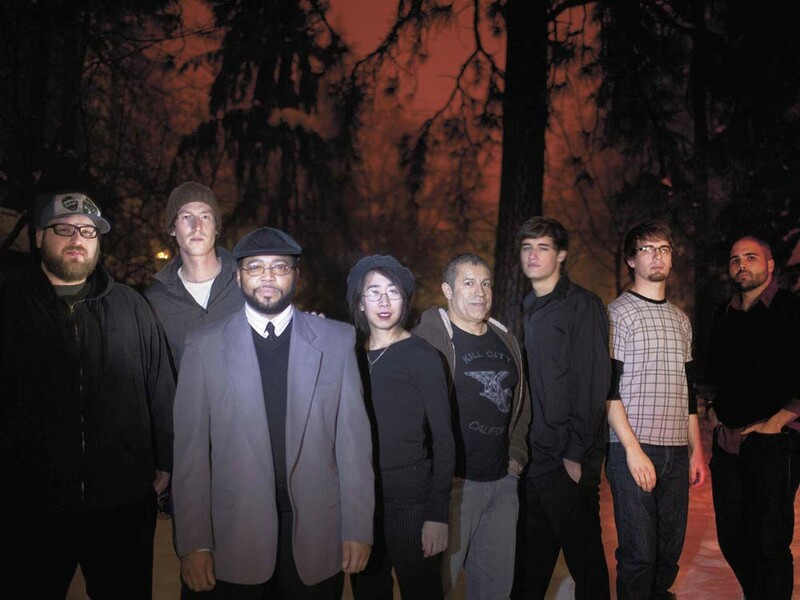 The Flying Spiders spin hip-hop beats with orchestrated instrumentation. He learned to breakdance in grade school. While his classmates played hopscotch and basketball at recess, Isamu Jordan and his friends laid out their cardboard for a throwdown. As a product of the 1980s, his pop culture icons revolved around Yo! MTV Raps and artists like Prince and Michael Jackson. Jordan’s now far removed from those glory days when he first discovered performance art. His musical roots grew, expanding across spoken poetry, musical journalism and rapping. And at the center of it all is a passion for the performance. In some ways, Jordan is reviving that lust with his new band the Flying Spiders. In size and experience, they are literally a supergroup. Vinnie Nickoloff of Big Wang Theory/Vax Lavala sits in on drums. Rajah Bose (Picture Radio) plays violin and sings. Armando Arguello (Son Dulce/the Longnecks/Los Vigiles) plays upright bass. Pete Johnson (the Longnecks) plays guitar. R&B artist Jamal Ali plays keys and contributes vocals. Thuy Dzuong-Nguyen plays piano. Sparky LaPlante (Groove Patrol/Real Life Rockaz) contributes sax, flute and vocals. And Eddie Taylor (Soup) adds flute and drums. The stage show is just as impressive as the lineup. The group’s solid hip-hop beats marinate in the full ensemble of instruments, creating both a visually complex live performance and a musically buoyant show. As an emcee, Jordan’s flow drips smoothly and sweetly but hardens lyrically — smooth caramel turns to bittersweet candy — with dense subject matter and cultural commentary. Themes of religion, black culture and education weave in and out of the groove his band creates. “I write about what I know, what I’ve been through and what I observe,” he says. The band claims everything from electronic to funk to R&B as influences and finds comfort in the stylistic sampling. The Flying Spiders are the newest addition to the local hip-hop scene (having only played three shows) — a small and struggling scene Jordan has been involved with since 1996. Jordan says it’s not feasible (or desired) for the Flying Spiders to saturate the music scene. They can’t play every week, much less every month — there’s just too damn many of them. Their unique style of hip-hop occupies its own space here, in between the cobwebs and the cracks. But pretty soon people will take notice. “Spiders have a presence that provokes a response,” Jordan says. The Flying Spiders play BeGin! • Fri, Dec. 10, from 6 - 8 pm • Museum of Arts & Culture • Free • All-ages • The Flying Spiders with Diamond Speedboat and the Dela Project • Sat, Dec. 11, at 9 pm • Aclub • Tickets: $5 • 21 • Call: 624-3629.